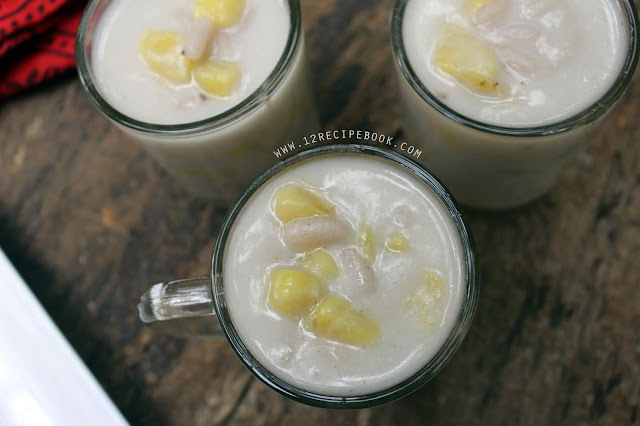 Pidi Payasam / Rice Dumplings and Banana Kheer is a delicious Malabar payasam preparation. 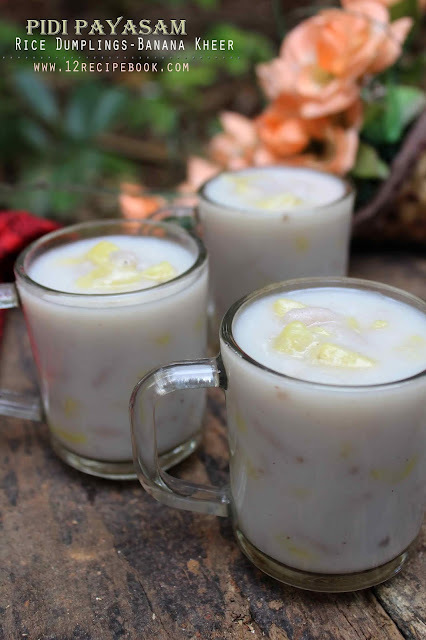 Try this healthy kheer at home and i'm sure you will love it. If you are more health conscious; You can add jaggery instead of sugar used here. Heat a pan with 1/4 cup of water and by adding salt. When it boils; make the flame to low and add roasted rice flour. Combine it well for two minutes and turn off heat. Transfer the mixture in to a plate and allow to cool little. Knead it in to a smooth dough while still hot. Now take tiny portions from the dough and make small oval shaped pearls out of it. Peel and chop the banana in to small pieces. In to a wide pan add the prepared rice pearls along with 2 1/2 cups of thin coconut milk. Cook for about 6 minutes until the rice pearls get cooked without mashing. Then add sugar and chopped banana pieces. Mix gently and cook for another 6 minutes or until banana pieces get cooked without mashing them. Then add the remaining 1 cup of thick coconut milk and cardamom powder. Add a teaspoon of ghee and turn off heat when it starts further boiling. Serve the payasam as warm or after cools down.